LS 4208 - Data capture simplified! 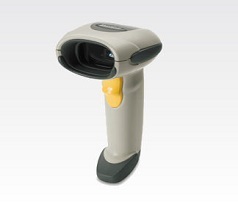 The Symbol LS4208 hand-held laser scanner delivers exceptional performance in an accessible, intuitive package. Its single-circuit board design ensures sturdiness and an ergonomic shape maximises user comfort. Continuous one-pass scanning, an innovative multi-line rastering scan pattern, a wide working range and superior motion tolerance make data capture easy, even for novices. This scanner comes in two models: the LS4208-SR, which handles all 1D bar codes and the LS4208-PR, which can also capture PDF417, microPDF and composite symbologies. Available in both 1D-only (SR model) and PDF/Composite (PR model) configurations. Improves productivity by reducing the need to rescan bar codes or key in data. Enables end users to quickly move from one bar code to the next. Reads good quality as well as poor quality codes at similar ranges, reducing re-scanning. Offers dual functionality save critical counter space. Withstands multiple drops to concrete, minimising downtime due to accidental drops. Enables rapid deployment and immediate use without formal training. Enables presentation scanning, with automatic switching between hands-free and hand-held modes. Supports the latest symbologies to future-proof your investment.